In Toronto, a lot can change in a very short period of time, especially in the world of real estate and development. 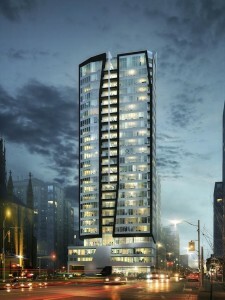 CentreCourt Developments’ Core Condos sold out all 220 of its condo units in three weeks. It’s good for both the market in general, and for the east side of downtown Toronto specifically, where sales have traditionally been a bit slower. Set to rise 24 storeys from the corner of Shuter and Dalhousie, the Page + Steele / IBI Group Architects-designed tower will feature two distinct facades differentiating the eastern and western elevations, and a unique three-storey podium with stone and heritage facades. Core’s 220 units will range in size from 390 sq ft to 775 sq ft, with amenity spaces including a 3,000 sq ft open concept lounge with a café/bar, as well as beanbag and hanging chairs.